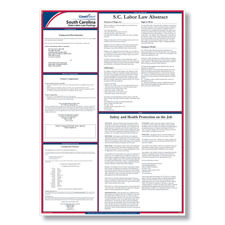 The all-in-one ComplyRight South Carolina labor law poster contains all mandatory and recommended posters for your South Carolina business, including Workplace Safety, Workers' Comp and Unemployment Insurance. The South Carolina Unemployment Insurance poster has been updated to reflect additional information on how to apply for unemployment benefits. The South Carolina Unemployment Insurance poster has been updated to reflect that individuals unemployed as a result of domestic violence may be eligible for unemployment insurance benefits. 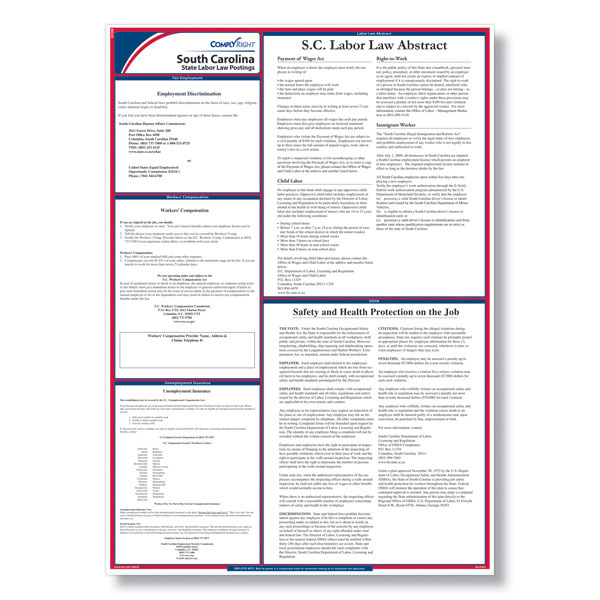 The South Carolina OSHA poster has been updated with new information on how state and local government employees may file an OSHA complaint. The South Carolina Labor Law Abstract poster has been updated to reflect that E-Verify is now mandatory and must be used to verify the eligibility of new employees. The law goes in effect on January 1, 2012.